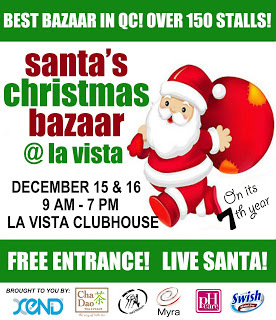 Shop at Santa's Christmas Bazaar @La Vista!!! Where: La Vista Clubhouse and Basketball Court, Katipunan, Q.C. Be there to experience the biggest bazaar in Quezon City with over 150 participating booths. They have also numerous activities for all bazaar visitors such as hourly raffles and games, free gift wrapping services, and a live Santa Claus for the children. They have also a free make up for all the bazaar visitors. Just pre-register by emailing your name and contact no. to claudbaron@yahoo.com And claim your free make up (worth Php180) at the Registration booth. 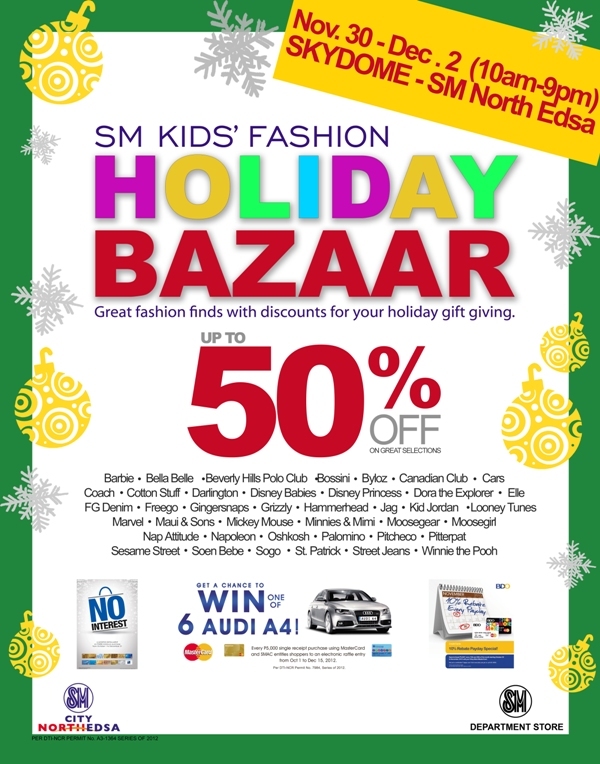 You may visit Santa's Christmas Bazaar at Facebook for more updates. Here's another informative issue for all of us. The awareness and push to go green has been greater than ever, thanks to the concentrated efforts of corporations, organizations, and the media. From recycling to using earth-friendly materials to efficient energy consumption, there are now myriad of ways to minimize one’s carbon footprint and save money in the long run. 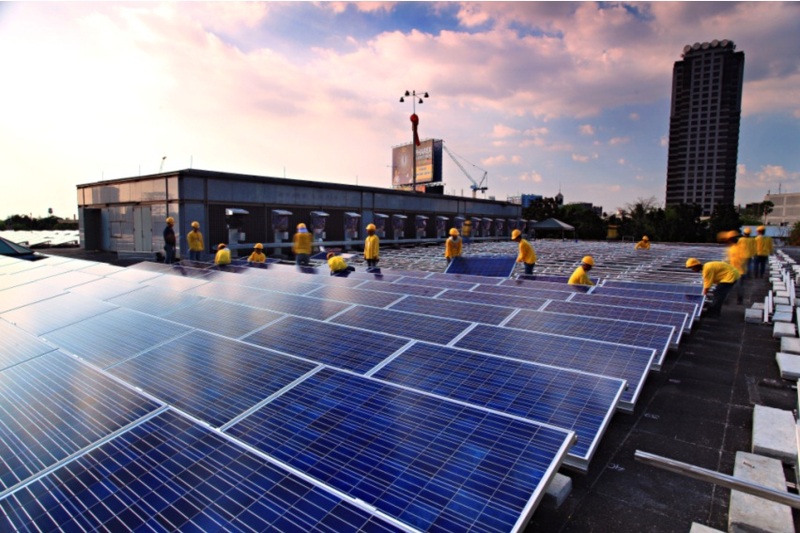 To do both, one of the more efficient and effective ways is through the use of solar power technology, or photovoltaic panels also called PVs. The said system collects energy from the sun to generate electricity, which can then be used to power a portion of a home or office’s electrical needs. Solar energy reduces the amount of fossil fuel that is burned, which subsequently reduces the pollutants and CO² that make it to the atmosphere. Depending on the type of system, a complete home or office set-up normally powers select appliances such as lights, air-conditioners, and certain electrical outlets. Typically installed on rooftops, solar panels collect DC power and send it to an inverter which then converts it into AC (alternating current) power. The AC power goes from the inverter to the electrical panel, where it now becomes ready to use. Once the solar system produces more power than needed, the meter actually spins backwards. A home or office is still, of course, connected to the utility grid so it can get as much power as it needs outside of what the solar system produces. Whether for a home or office, the solar system you need must be customized in order to get the best possible performance, which subsequently will bring about the best cost and energy savings as well. Green Heat (GH), a locally-owned business engaged in the design, installation, and maintenance of solar PV systems, has the right technology, expertise as well as experience to do the job right. 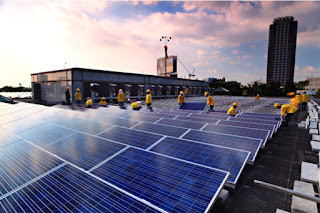 Green Heat has been part of numerous large scale projects such as the ADB solar power plant, the Rural Electrification of the Philippine government, and other private installations. Green Heat uses silicon-powered technology: the world's most dependable solar technology. With over 40 years of demonstrated field performance, silicon modules have continued to outlast and outperform other solar technologies. Since roofs have limited space for solar modules, GreenHeat’s panels have higher module efficiencies. This means each panel works better in absorbing energy. Moreover, GH’s panels have “Enhanced weak light performance,” where the solar glass ensure that the panels perform well under real world, low light conditions. special layer in the high quality solar glass of the modules causes water to run off more quickly, thereby enabling the glass to clean itself of dust and dirt. Solar PV panels are, of course, just a part of the entire system. As the saying goes, “You’re only as strong as your weakest link.” In solar PV technology, the rest of the system has to be just as efficient and reliable; otherwise the best panels won’t give you the ideal return of investment. This is something that Green Heat can do for its customers. By providing a turn-key service, Green Heat provides clients a complete assessment of their solar energy requirements during the proposal stage that cover system design and cost. Once the go signal is given by the client, GH executes the design plan and turns over the system after a series of tests. With a one-year after sales warranty, clients can be assured that their solar PV set-up will be a reliable one. So if you’re looking to the future of energy, start today with solar PV technology. It’s an investment that goes a long way in saving you money, and the environment. To learn more about solar PV technology, visit www.greenheat-intl.com. In celebration of this season of giving, KIPLING bag (Belgian brand) joins forces with World Vision to bring “A Brighter Christmas For A Brighter Tomorrow.” This program aims to provide additional funds for the education of children under the care of the world renowned Christian development and advocacy organization. Ms. Miriam Quiambao graced the event. “We are very delighted to have this partnership with Kipling, which is known globally for bringing fun and joy through its fashionable bags. Were happy that this time, Kipling decided to reach out and bring the same kind of goodwill to ensure the education of children sponsored by World Vision,” says National Resource Development Associate Director Jun Godornes. Fashionable ladies on-the-go can also shares in giving children a brighter tomorrow by shopping for a cause. For every Kipling bag or luggage purchased from December 1 to 31, 2012, Kipling will donate Php500 to World Vision. Joining Kipling and World Vision in celebrating the launch of this meaningful endeavor are some of the country’s biggest celebrities who are also extending their support to the program. These include Miriam Quiambao, Jasmine Curtis-Smith, Kylie Padilla and Jessica Connelly. For its Holiday Collection, Kipling offers sporty and glam bags called Basic Elevated. These perfect everyday adventure companions come in stylish quilted exteriors, patent details, stunning linings, and 3 Christmas-themed colors red, white, and black. Teagan S, a travel-savvy trolley with 2 compartments that are accessible from the topside. Creativity X a totally essential-ready cross-over bag. “Kipling’s Holiday Collection is a line eagerly awaited by our loyal customers, but this time, we’d like to enjoin them to share the blessings of the season by participating in this program. This is because with every purchase of any Kipling bag, our customers get to enjoy cutting-edge designs and fashion- forward pieces as well as help build a brighter tomorrow for the less privileged children,” adds Millet Antonio, brand manager of Kipling in the Philippines. Also helping raise awareness about Kipling’s A Brighter Christmas for a Brighter Tomorrow with World Vision program are our ad agency The Sven Group and talent agency Vidanes Marketing. KIPLING is available online at zalora.com.ph and at SM Mall of Asia, SM North EDSA The Block, SM Megamall, SM Bacolod, SM Iloilo, SM Davao, SM Cebu, SM Lanang Premier, Robinsons Place Ernita, Rustan’s Alabang Town Center, Rustan’s Shangri-La, Rustan’s Makati, Landmark Makati, Landmark TriNoma and soon-to-open Centrio Mall in Cagayan de Oro. To know more visit Kipling Philippines on Facebook and get to find out more exciting news and promos from the lovable monkey. UNIQLO's shirts, jeans, jackets on promo prices from November 16 - 22!! UNIQLO, Japan’s leading global apparel brand, opens its second store in the Philippines on November 16 at SM City North EDSA, The Block. This also marks the start of Holiday Shopping as UNIQLO offers great opening promotion for its high quality and fashionable pieces. Shirts, Jeans and Jackets are priced at unbelievable promo prices. From November 16 until November 22, 2012, UNIQLO products like the Men’s Tokyo-Omiyage graphic t-shirt (Regular Price P790) can be purchased for only P590, while the Men’s Regular Fit Straight Jeans (Regular Price P990) is also offered on sale at P590. For the women, the Women’s Reversible Fleece Jacket (Regular Price P990) can be purchased at a low price of P790 while the Women’s Heattech Short Sleeves T-Shirt (Regular Price P590) is offered at P490. Visit the newest UNIQLO store in the Philippines at the 2nd floor of the SM City North Edsa, The Block, Quezon City, from November16-22, 2012 to enjoy these limited special offers. 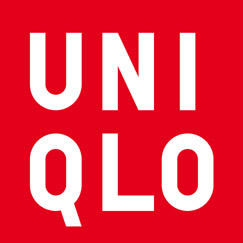 UNIQLO is a global apparel brand known for its “MADE FOR ALL” philosophy where people express themselves through its unique, yet high quality and fully functional clothing line. Store hours are from 10 a.m. to 10 p.m. Scouting for the perfect present for your girl friends? 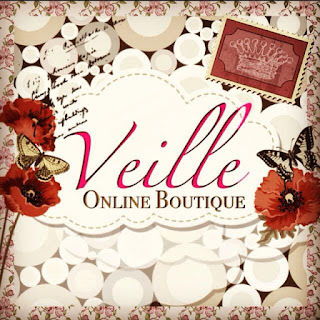 “VeilleBoutique” is the answer for you. Veille (spanish word for “Eve”), an online boutique has lots of great accessories that would make wonderful gifts. It offers a varied range of accessories from necklace, earrings, ring, bracelets and bangles. Here are some of the accessories you can choose from. Be in love with these adorable necklaces. Feel the affection of these endearing rings. Find irresistible with these appealing bracelet. The starting point “Netizens Choice Awards” was the booming recognition on Bloggers online. Starmometer, Showbiznest and LionhearTV join forces to bring the latest ‘star awards’ which will give netizenz power in recognizing the hard work and excellence of celebrities and their achievements over the last year. “Netizens Choice Awards” will celebrate the trending hottest celebrities in television, dario, music, film and the web in the choicest. Starting November 10, everyone who has access to the internet can vote once each day per category for their favorite “Netizens Choice Awards” nominees at www.starmometer.com, www.showbiznest.com, www.lionheartv.net . Through these votes will generate an alternative results’ page. The entry with the highest votes will be listed as first. You as readers can see how many votes each project has received. You are given a maximum of 3 votes, 1 each categories per day. This is a writing project. Anyone who has blog in at least 3 (three) months with at least 3 posts in any niche is eligible to join in this writing project. Please include the links of the three host blogs www.starmometer.com, www.showbiznest.com , and www.lionheartv.net (must be live links [clickable]) in your blog entry and help us spread the word and encourage everyone to participate. 1. Which among the TV stations is the best for you? Write a blog post about your favorite TV station and state why you chose that station. 2. Post a comment in any of the three host sites to let us know about your entry. Only onw entry per blogger. Cut-off date and time for submission of entries is on December 8 (until 11:59pm) after the said date, submission of comments in this page shall be closed. Today is the showing day of Star Cinema’s latest offering “Suddenly It’s Magic”. This movie is a great combination of Kapamilya actress (Erich Gonzales) and an international Thai actor (Mario Maurer). It will feature scenes shot both in the country (Philippines) and Thailand. Mario will be playing Marus, a Thai actor who wanted to take a break from his celebrity life and go to the Philippines as a regular person. He met Joey (Erich) a baker who wanted to fulfill her dream to be a pastry chef. At first they contradict each other until they feel that magic between the two of them. But coming from different state of life and culture how will that continue that magic? “Suddenly It’s Magic” is directed by Rory B. Quintos. It also stars are Joross Gamboa, Guji Lorenzana, Ces Quesada, Cacai Bautista, Dinkee Doo, John Lee, Joy Viado and Pimchanok Luevisadpaibul. A celebration of renewal from Cohen’s Lifestyle Centre!!! Cohen’s Lifestyle Centre celebrates the personal battles won and healthier lifestyle gained by the Cohen graduates with Re: New Me 2012. Carrying the theme “Fit for the Red Carpet”, the event celebrates the successful transformation of the Cohen Program graduates through a fashion show and photo exhibit that showcase their new fit and slimmer bodies as well as their renewed, healthier lifestyle. Likewise, the event brings together the entire Cohen community– from graduates, non-graduates, medical professionals, and health and wellness advocates alike. According to Barbara Young, CEO of Cohen’s Lifestyle Centre, the fashion-inspired event is dedicated to the graduates of the Cohen program. “These incredible men and women have successfully lost weight, which may be impossible to some. This achievement is worth recognizing because they not only gained confidence from having bodies worthy of being seen in the red carpet, but more importantly, they acquired new outlooks in life after overcoming their weight and health issues. This is their time to shine,” say Young. The Cohen Program was formulated by Dr. Rami Cohen, MD, a specialist renowned for his research on hormones involved in obesity and weight loss. It is based on internationally-accepted medical research with thousands of success stories worldwide. With the Cohen Program, Dr. Cohen personally develops individually-tailored Eating Plan. Each plan is based on a person’s unique body chemistry. This personalized eating plan is designed to trigger the body’s natural ability to shed off fat rapidly and safely and bring their hormones back in balance. No two Eating Plans are the same. The essential formula is the specific quantity and combination of food unique to each person. And only by following the program precisely can one allow their body to correct its chemical imbalance naturally. 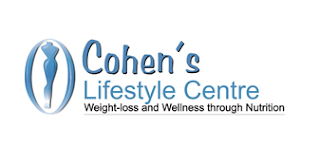 Another unique offer of Cohen’s Lifestyle Centre is the establishment of a Cohen Community– graduates who have successfully completed the Cohen Program and non-graduates who are still on the journey to healthier body and lifestyle. Both share a similar experience of what it feels like having gone through a challenging ordeal. Hence, they build a support system that encourages and inspires each other to persevere and stay on the program. “Completing the Cohen program requires discipline and patience. This is why we established the Cohen Community– to provide our clients who are undergoing the program the support and encouragement from people who have gone through the same program and understand the challenges that they face,” adds Young. Re: New Me 2012 is presented by Splenda and sponsored by Mosvit, Other sponsors include Ayala Land Premier, Lady’s Choice MayoLite, Pond’s, Pioneer Life Insurance, and Bulla Lite n’ Healthy Yogurt. 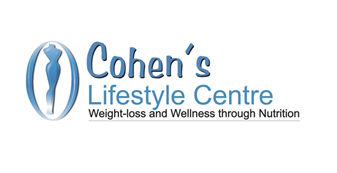 The Cohen program is exclusively offered in the Philippines at the Cohen’s Lifestyle Centre. To know more, visit the Cohen’s Lifestyle Centre Philippines at Suite 1006, 10th Floor Medical Plaza Makati Building, Amorsolo cor. de la Rosa Streets, Legaspi Village, Makati City. You may also log on to www.cohenlifestyle.com.ph or email info@cohenlifestyle.com.ph or call 502-1090, 501-5237. Spoil n' Shower from BAMBU!! Hey guys! 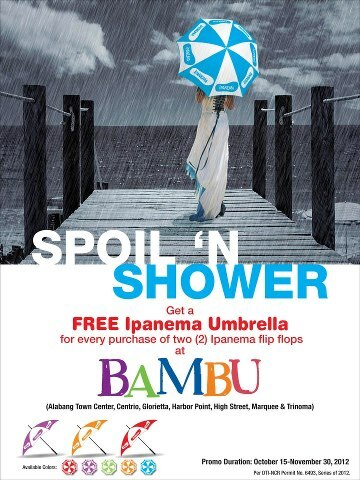 You can have a chance to get a Ipanema umbrella if you purchase two (2) Ipanema flip flops at any participating BAMBU boutique. So shop now at Bambu boutiques (Alabang Town Center, Glorietta, Harbor Point, High Street, Marquee mall and Trinoma). After the hits teleserye One True Love, GMA Artist Center talent Alden Richards now takes on a new challenge. He was recently part of the Cosmopolitan Bachelor Bash 2012. But along with his boyish good looks came a lot of hard work and preparation. Because as we all know, failure to prepare is preparing to fail. Physically, his aim was to be the best-looking Alden Richards his fans could be truly proud of. His trainer’s goal for him was to lose excess fat, beef up his upper body, and maintain good posture. This was achieved through a rigorous daily routine of 15-20 minutes of jumping rope as often as he can, even in-between taping schedules. Aside from that, he made sure to incorporate 20-30 minutes of running in his routine for additional cardio. To develop core strength and fitness, Alden supplemented his workout routine with abdominal exercises. This includes 20-30 reps of hanging leg raises, abdominal rollers, ball crunches, planks, pikes and side bends. Months prior to the event, his personal trainer and nutritionist limited Alden to a calorie intake of only 3,100 kCal per day. This meant that he had to eat 5-6 small meals per day, spread out over 2-3 hour intervals. This diet was not only about losing weight but also being healthy. A complete balance of protein, carbohydrates, fruits and fiber was recommended, while at the same time avoiding soda, ice tea, and salty chips. This diet also required him to stay hydrated throughout the day. But to make things fun, he was allowed one “cheat day” to eat anything he wanted. Because he wanted to stick to his new lifestyle, he made a conscious effort to stick to only one cheat day per week. This was quite a sacrifice for the young actor, but he discovered that it was well worth it when droves of fans cheered for him at the Cosmo Bachelor Bash. Alden is committed, passionate, and disciplined in anything that he does. It not only shows through his breakthrough roles and performances, but in every aspect of his life. Catch more of Alden Richards in GMA’s upcoming teleseryes, Party Pilipinas, and follow his tweets @aldenrichards02. ABS – CBN’s newest offer this October 8 on Primetime Bida is the top caliber drama series titled “Ina, Kapatid, Anak”, featuring primetime princesses Kim Chiu and Maja Salvador. In this drama series, Kim Chiu will portray the role of the poor but optimistic young girl named Celine. Maja, on the other hand, will play the character of the rich and glamorous woman, Margaux. Both Celine and Margaux are born fighters and they do not allow their families to be maltreated by anyone. Aside from the highly anticipated confrontation scenes between Kim and Maja, TV viewers are even more excited with the two’s love interest in the story. Kim will be paired again with Xian Lim, while Maja will team up for the first time with Enchong Dee. “Ina, Kapatid, Anak” is a compelling story about family, love, power, rivalry and acceptance. Itfeatures a powerhouse cast composed of four of the hottest young stars of their generation Kim Chiu, Xian Lim, Enchong Dee and Maja Salvador; highly-acclaimed seasoned actors Janice de Belen, Cherry Pie Picache and Ariel Rivera; and well respected veteran stars Ronaldo Valdez, PilarPilapil and Eddie Gutierrez. It is directed by Don Cuaresma and Jojo Saguin. For more updates, log on to www.facebook.com/InaKapatidAnak.TV or follow @_InaKapatidAnak on Twitter. X – Factor Philippines says Goodbye to JERIC Medina!!!! X – Factor Philippines Final 5 perform for the “Revival” theme at PAGCOR Theater, Paranaque city last September 22, 2012. It was an impressive show from Allen Sta. Maria (Katy Perry’s Teenage Dream), Gab Maturan (Paolo Santos’ Moonlight on Paris), Daddy’s Home (Side A’s Tell Me), KZ Tandingan (Adele’s To Make You Feel My Love) and Jeric Medina (Eric Gadd’s Dou You Believe in Me). X – Factor Philippines with the ever gorgeous KC Concepcion. Daniel Padilla and Khalil Ramos perform at the X – Factor Philippines Result night (Revival theme). Meet the bottom 2 (Daddy’s Home and Jeric). This is the hardest part to the judge/mentors to choose among the bottom 2 (who will they send home?). And the saddest part!!! After he perform his survival piece (I Don’t Wanna Missed a Thing) Jeric sent home via “Deadlock” with text vote of 16.74% versus 19.63% of Daddy’s Home. And the X – Factor Philippines Final 4 are KZ Tandingan and Allen Sta. Maria (Charice’s Girl category), Gab Maruran (Martin’s Boy category) and Daddy’s Home (Gary Valenciano’s Group category). October 6 -7, 2012 will be the last Performance and Result night, who will be part of Final 3? X – Factors Philippines will air right after Maalaala Mo Kaya (Saturday) and Sarah G. live (Sunday) at Kapamilya network. On its second week, “The Mistress” already exceeded the Php 100 million box office mark. “The Mistress”, Star Cinema’s latest offering top billed by Bea Alonzo and John Lloyd Cruz is continuing to break records in its second week of screening in 200 cinemas in the Philippines and selected cinemas in different parts of the world. After watching this movie last Wednesday with my friends (Joy, Lyn, and Lani) at Greenbelt 3, I personally commended Bea and John Lloyd and also Direk Olivia Lamazan for their wonderful piece. I’ve seen a different Bea and John Lloyd in this movie. And also I like the controversial ending that captured not just mine but everyone’s hearts that moved the audience to watch “The Mistress” over and over again. “BIKTIMA” on September 19 na!!! Two of Philippine’s cinema most reliable Cesar Montano and Angel Aquino combine forces with a young and passionate director, RD Alba in a movie that you should not miss. “Biktima”, a dramatic thriller movie that will hits theater on September 19. Shot entirely in picturesque yet perilous Bohol – which also happens to be the male lead‘s hometown, Biktima zeroes in on the travails of a female TV reporter (Angel Aquino) who wants to make something else outside of her being a wife and mother. As a news journalist for a local TV channel, Alice de la Cruz (Angel’s character) sets off on a dangerous trek to the island of Kamandao in Bohol against her husband Mark’s (Cesar Montano) warning. From left; Direk RD Alba, Cesar Montano, Angel Aquino, Mercedes Cabral and Philip Anthony. In the midst of an attack by insurgents, Alice is believed to have died in the ambush with her fellow reporters. Devastated and left to care for their son, Alice’s husband Mark turns to the former’s best friend Sandra (Mercedes Cabral) for solace and love. Things seem to have gone back to normal for Mark and Sandra until Alice is found alive after six months, her memory almost totally erased. Husband and wife get back together but then the missing pieces of what happened in the months that she disappeared fall into place and this triggers psychological scars to unravel and gradually erupt into an explosive crescendo. Cesar, who has worked earlier with Biktima’s director RD Alba in the much awarded Panaghoy sa Suba (2004) which the actor himself headlined and helmed (RD was credited as associate producer of Panaghoy), welcomes the chance to work with his old friend. “He knows what he is doing. He is sure about his vision for the movie and masarap siyang katrabaho,” says Cesar of Direk RD who with Biktima gets to direct his first full-length feature film. And it was distributed by Star Cinema, Production. In an age when psychological thrillers come few and far in between, Biktima is one film event that should not be missed. Also lending gravitas to the story of love and marriage at a time of rebellion are Cesar’s real-life wife Sunshine Cruz, actor-director Ricky Davao and British-born actor Philip Anthony. Premiere rapper Gloc-9 is proud of his new album MKNM: Mga Kwento Ng Makata, his first under Universal Records. According to Gloc-9, he works very hard for this album it took him to record for around six months. He add that he is ultimately satisfied with the album, which includes collaborations with some of the biggest names in the industry – from Chito Miranda to Bamboo to Ebe Dancel to Jay Durias to Billy Crawford to Ian Tayao of Wilabaliw, among many others. This album MKNM: Mga Kwento Ng Makata contains various stories from people from all walks of life. Gloc-9 has always been fond of stories of other people. The album’s single Sirena, which talks about the story of a responsible gay man. The music video of Sirena which boasts of Boy Abunda’s participation is a certified hit after it was released. 1. “Sirena” feat. Ebe Dancel, (life story of a gay person). The rapper also adds that the new album MKNM: Mga Kwento Ng Makata marks a new chapter in his career as this is his first release under Universal Records, where he joins its elite rosters of artist like Gary Valenciano, Jose Mari Chan, Ogie Alcasid RegineVelasquez, Parokya ni Edgar, Christian Bautista, Kamikazee, Sponge Cola, Sam Concepcion, among others. SMART users’ text FREN & send to 2728. Meet the newest Watsons ambassadors and they share what they value & how they found great value in Watsons. Since becoming a runner-up at the Miss Universe 2010, Venus Raj’s has become very occupied with the many facets of her new life - a beauty queen, a morning show host, an endorser and a daughter. And when the time to rest comes, she makes sure she gets to do the things she loves, too, like pampering herself with wellness activities. As head of every family and home, husbands and fathers are partners in home building and not just providers. Behind every man’s success is a woman who encourages and inspires. She is every man’s partner in the shaping of a happy home where dreams see fruition. “To a woman like my wife (Christine Jacob-Sandejas), only the best lang talaga. We’ve been married for 12 years – Christine has supported me in all the ups and downs, and gave birth to our five great kids. In turn, of course I want to make sure that she is in top shape. It really amazes me how she is always ready to do different activities with me & the kids everyday! Christine takes care of everyone so I take care of her naman. She means the world to me,” gushed Paco Sandejas, loving husband to celebrity mom, Christine Jacob-Sandejas. Really, whatever you value, Watsons values you. Comply & Save, Watsons Health Packs, Watsons Compliance Packs and Buy Generics are just some of the value offers that aim to make quality healthcare within easier reach for all Filipinos. And beyond affordability, Watsons also has a strong network of well trained pharmacists that provide free health services and medication counseling. Watsons pharmacy -- bringing you more value so you can get more out of life.